Note: Paper presented at a symposium on "What Hypnosis Does for Psychology", chaired by David Spiegel, at the annual meeting of the American Psychological Association, San Francisco, August 18, 2007. Hypnosis has never been a central focus of experimental psychology. William James devoted an entire chapter of the Principles to hypnosis, but nobody else ever did -- not even Jack Hilgard. The most attention hypnosis gets in introductory textbooks is a treatment, alongside sleep and dreams, in the chapter on consciousness -- if there is one; and, perhaps, a discussion in the chapter on memory of the problems associated with the hypnotic "recovery" of ostensibly repressed memories. Graduate students in experimental psychology take their degrees in cognitive or developmental psychology, or personality and social psychology, but not in hypnosis. And in more than 35 years of scanning the advertisements for academic positions, I've seen lots of openings for specialists in memory, or social development, or personality assessment, or attitudes; but I've never seen a single one for a hypnotist. If you look at the hypnosis researchers who have been successful in academia, it hasn't been because of their interest in hypnosis. Rather, it's been because they've been able to connect their interest in hypnosis to other topics that have somewhat broader appeal. And that is, I suppose, the way it should be. Nevertheless, hypnosis is intrinsically interesting to many experimental psychologists. With just a few words of suggestion from the hypnotist, hypnotizable subjects can experience -- please forgive me for putting it this way -- the most profound alterations in consciousness. They see things that aren't there, fail to see things that are there, feel like children again, remember things that didn't happen, perform complicated actions without knowing what they're doing or why, forget what they've just been doing, and then remember it all again. Who wouldn't be interested in hypnosis? And indeed, many researchers have thought that the mysteries of hypnosis could be revealed by the application of the concepts and methods of experimental psychology. That was certainly the view of P.C. Young, better known for his studies of hypnotically induced antisocial and self-injurious behavior (Paul C. Young, 1950; P.C. Young, 1952), who in 1926 completed an extensive doctoral dissertation on hypnosis, under the supervision of William McDougall at Harvard (P. C. Young, 1925, 1926). These 21 experiments count as the first comprehensive experimental investigation of hypnosis. In another line of research, Young took what was known about psychological development and used it to explore the nature of hypnotic age regression (P. C. Young, 1937, 1940). And this was also the viewpoint of Clark L. Hull, who was introduced to hypnosis by Joseph Jastrow, his mentor at Wisconsin (Blumenthal, 1990), but whose own doctoral dissertation was a pioneering study of concept formation (for which he invented the memory drum). Hull then explored the effects of tobacco on human performance, and worked on aptitude testing, before finally turning his attention to hypnosis, culminating in the book we all admire (Hull, 1933) (Kihlstrom, 2004). 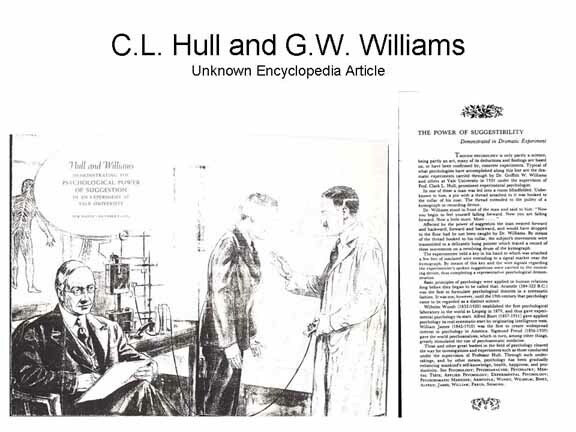 And as if that book were not enough, Hull also left sketches for 102 (not 100, not 101, but 102) additional studies that he thought might be profitable to undertake (Hull, 1930a, 1930b) -- as well as another 40 studies on nonhypnotic suggestibility (Hull, 1929). Throughout, Hull's attitude seems to have been that hypnosis was kind of a crucible for experimental psychology -- that if this science were really all it was cracked up to be, then it ought to be able to understand something like hypnosis. For Young and Hull, the relation between hypnosis and experimental psychology was strictly one-way. They thought that they could learn something about hypnosis by applying psychological theory and research, but they did not expect that hypnosis would repay the debt, by telling us something new about mind and behavior. This is especially true of Hull, who, when it came time for him to advance a theory about hypnosis, simply labeled it a "habit phenomenon" -- something that people got better at with practice. And when he subsequently turned his attention to learning theory, he didn't even bother to mention hypnosis as an example of learning (Hull, 1943, 1952). Hypnosis was to be understood in terms of things that were already understood; it wasn't going to change our understanding of anything. Other psychologists, however, have taken quite a different view. For them, hypnosis was of interest because it shed unique light on the workings of mind and behavior. That is, understanding hypnosis was important because it would have implications for how we thought about the basic principles of psychological theory. This was certainly the view of William James -- and the reason why he devoted an entire chapter of the Principles to hypnosis (Kihlstrom & McConkey, 1990). James's interest in hypnosis had its source in his interest in the will, and he thought that hypnosis could shed unique light on the problem of how ideas, in the form of suggestions, generated action, in the form of hypnotic behaviors. Hence his ideomotor theory of action, later revived by Magda Arnold (Arnold, 1946) and, still later, by Irving Kirsch and Steve Lynn (Kirsch & Lynn, 1997). And of course James was interested in the implications of hypnosis for our understanding of consciousness. For James, based on his introspections, the idea of unconscious thought was almost an oxymoron. Still, he was persuaded by Janet's observations, and his own, that in hypnosis things could be (unconsciously) felt but not (consciously) perceived, and that mental activity could be divided into multiple streams, only one of which was accessible to phenomenal awareness at any given time. Jack Hilgard took the same view. Like James, his early interest in hypnosis was stimulated by problems of volition -- in particular, by the fact that hypnosis seemed to reverse the normal relations between voluntary and involuntary behavior (E. R. Hilgard, 1964). 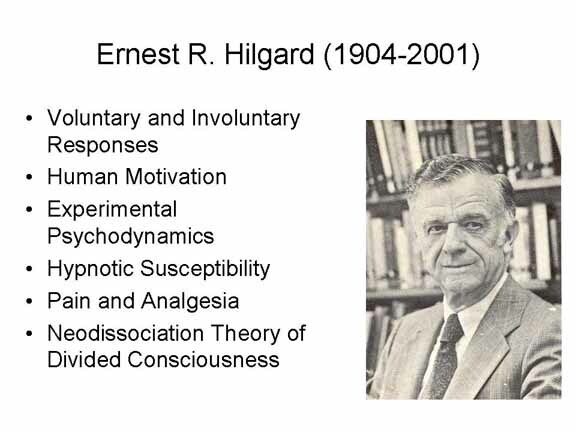 And like James, Hilgard was persuaded by hypnosis experiments that consciousness could be divided, leading to his "neodissociation" theory of divided consciousness (E. R. Hilgard, 1977). That was then: this is now. What does hypnosis have to offer experimental psychology today? Defining experimental psychology narrowly, there are several instances where hypnosis seems to have taught us something new about cognitive processes, and especially about unconscious processing (Kihlstrom, 2007). The first of these is source amnesia, a phenomenon of considerable interest to cognitive psychologists and cognitive neuroscientists, but which was initially discovered, and named, in the context of hypnosis (Evans, 1979; Evans & Thorne, 1966). Under the guise of a test of general information, Evans and Thorn taught subjects obscure facts like the difference between the antennae of a moth and those of a butterfly (those of moths have long, furry hairs), or the color an amethyst turns when exposed to heat (yellow). Then they gave their subjects a standard suggestion for posthypnotic amnesia. When the subjects came out of hypnosis, they had little memory for the things they had done while hypnotized, including the general-information test. But when asked about moths, butterflies, and amethysts, a substantial portion of these otherwise amnesic subjects nonetheless answered correctly. Further, when asked where they had acquired the information, they either said that they did not know, or they confabulated the source. Evans' observation was somewhat controversial within some hypnosis circles (N. P. Spanos, Gwynn, Della Malva, & Bertrand, 1988; Wagstaff, 1981), but later -- much later -- similar observations were made on neurological patients with amnesia (Schacter, Harbluk, & McClachlan, 1984; Shimamura & Squire, 1987), and in normal aging memory (Craik, Morris, Morris, & Loewen, 1990; E. L. Glisky, Rubin, & Davidson, 2001). Source amnesia is now firmly established as a phenomenon of memory -- which illustrates one of my favorite ironies in psychology: psychologists are reluctant to believe self-reports unless they come from people who are brain-damaged. Source amnesia is commonly interpreted in terms of the dissociation between episodic and semantic memory, which in turn suggests that separate cognitive (and perhaps brain) systems underlie these two aspects of memory. The episodic-semantic distinction did not arise in a hypnotic context, but source amnesia did. For the record, Evans and Thorn noted that their experiments were inspired, in turn, by research by Bannister and Zangwill (Banister & Zangwill, 1941a) on paramnesia (see also Banister & Zangwill, 1941b). In these experiments, amnesic subjects recognized items that had previously been presented, but confabulated the context in which they had encountered them. But these experiments, too, involved hypnosis. So even if the concept of source amnesia has a history prior to Evans and Thorn, that history involves hypnosis. Also relevant to the episodic-semantic distinction were some experiments on posthypnotic amnesia, employing more standard verbal-learning procedures (Kihlstrom, 1980). In one experiment, hypnotized subjects memorized a list of familiar words, and received a suggestion for posthypnotic amnesia. When they awakened, they couldn't remember the words they had learned, but they were still able to use those words as responses in tests of free association and category generation. Again, remembering a list of words is a matter of episodic memory; but free association and category generation are matters of semantic memory. Again, the claim that posthypnotic amnesia affected episodic but not semantic memory was controversial in some hypnosis circles (Bertrand, Spanos, & Radtke, 1990; N. P. Spanos, Radtke, & Dubreuil, 1982). Nevertheless, Endel Tulving, who originally hypothesized that episodic and semantic memory were different, cited this experiment as one of only four studies that convinced him he was right (Tulving, 1983). Taken together with source amnesia, then, we can say that hypnosis contributed to a major change in theories of the architecture of memory. But, as they say in the television ads, that's not all. Not only did posthypnotic amnesia dissociate episodic and semantic memory, but amnesic subjects were also more likely to use words that they had previously memorized as free associates and category instances, compared to control words that they had not memorized. This is a priming effect. In 1980, we didn't have a good term to capture priming effects in amnesia; now, of course, spared priming in amnesia is interpreted in terms of a distinction between explicit and implicit expressions of episodic memory (Schacter, 1987). Hypnosis was not the first to show spared priming in amnesia, but it was early -- before implicit memory even had a name. More important, however, hypnosis has made an important contribution to theory by expanding the domain of implicit memory. Most studies of implicit memory in neurologically intact subjects employ highly degraded encoding conditions, such as shallow processing, to impair explicit memory. But in posthypnotic amnesia, encoding is not by any means degraded: the subjects deliberately memorized the list to a strict criterion of learning before the amnesia suggestion was given, and they remembered the list perfectly well after the amnesia suggestion was reversed. Thus, they show that implicit memory can be dissociated from explicit memory even under deep processing conditions. More important, most studies of implicit memory in amnesia (and normal memory, too) concern repetition priming, as exemplified by stem-completion and fragment-completion tests. Repetition priming can be mediated by a perception-based representation of the prime -- and, accordingly, the most popular theories of implicit memory focus on perceptual representation systems in the brain. But in this study, the priming is semantic in nature, and must be mediated by a meaning-based representation of the prime. In this way, studies of hypnosis remind us that a comprehensive theory of implicit memory is going to have to go beyond repetition priming, and beyond perceptual representation systems. Hypnosis has similar implications for an analogous phenomenon of consciousness, implicit perception. Implicit perception is exemplified by subliminal perception, as in the famous experiments by Anthony Marcel. But again, in these cases the prime is severely degraded, either by means of brief tachistoscopic presentation or by means of a forward or backward mask. This is also true of priming in dichotic listening, parafoveal perception, inattentional blindness, and various forms of attentional blindness, such as repetition blindness and the attentional blink -- perceptual processing is very degraded. But a study of hypnotic blindness by Bryant and McConkey got evidence of preserved semantic priming, employing a homophone-spelling task, even though the stimulus was in no sense subliminal (Bryant & McConkey, 1989). Again, the priming is semantic in nature, not merely perceptual, but that is not what is really important about this study. What is really important is that priming and similar effects in hypnotic analgesia, deafness, and blindness have forced an expansion of implicit perception to include cases where the stimulus is in no sense subliminal, and has been deeply processed for meaning at the time of perception (Kihlstrom, Barnhardt, & Tataryn, 1992). One more example from cognitive psychology, and that concerns automaticity, as exemplified by the familiar Stroop color-word effect (MacLeod, 1992). The distinction between automatic and controlled processes is widely accepted within cognitive psychology these days, and has spilled over into personality, social, and clinical psychology as well (Kihlstrom, 2006). Some processes appear to be innately automatic, while other processes seem to become automatized through overlearning, but however they arise the assumption has been that once a process has become automatized there is no going back -- no way to un-ring the bell and regain conscious control over the process. There have been hints in the attention literature that even the Stroop effect isn't as automatic as we would like to think it is (e.g., Besner, Stolz, & Boutilier, 1997), though these hints have been hotly debated. More recently, however, Amir Raz and his colleagues have completely reversed the Stroop effect by means of hypnotic suggestion -- not by the usual suggestions for color-blindness, which don't work (e.g., Mallard & Bryant, 2001), but by means of what amount to suggestions for agnosia -- that the words in question are meaningless symbols (e.g., Raz, Shapiro, Fan, & Posner, 2002). The fact that you can get the same sort of effects without hypnosis (e.g., Raz, Kirsch, Pollard, & Nitkin-Kaner, 2006) doesn't matter. What's important is the demonstration that you really can unring the bell: Nobody would ever even have tried this without hypnosis. And the fact that you can de-automatize a process that has become thoroughly automatized is extremely important for theories of attention and automaticity. Now, in this talk I am going to define "experimental" psychology broadly, to include experimental social psychology as well as experimental cognitive psychology, and to include correlational methods as well as strictly experimental ones (I'm sensitive to this latter distinction because I once had a colleague who had his undergraduate experimental methods course taken away from him by his department because he taught correlational methods as well as all that stuff about control groups, counterbalancing, and the analysis of variance). First to correlational methods, and research on personality and individual differences. Hypnosis researchers tore their hair out for years, decades, trying to find personality correlates of hypnotizability, but they didn't strike paydirt until they began to develop scales measuring the occurrence of "hypnotic-like" experiences outside the hypnotic context -- first Ron Shor (Shor, 1960), then Arvid As (As, O'Hara, & Munger, 1962) and Josephine Hilgard (J. R. Hilgard, 1965, 1970), and most famously Auke Tellegen with his "Absorption Scale" (Tellegen & Atkinson, 1974). The reason for the frustration, it turns out, is that there were major aspects of personality, like absorption, that weren't represented on conventional personality inventories, such as the MMPI and the CPI. Tellegen realized this from his reading of the hypnosis literature, and set out to include a scale of hypnotic-like experiences in the Multidimensional Personality Questionnaire, a new inventory that he was developing to replace the CPI. I think it is no accident that the "Big Five" structure of personality took the shape it did in the aftermath of Tellegen's work. Earlier, the fifth factor had been defined in terms of intellectance (Fiske, 1949) or culturedness (Norman & Goldberg, 1966). But beginning in the 1980s, it came to be defined in terms of openness to experience (Robert R. McCrae & Costa, 1980) -- and with explicit reference to Tellegen's work, which almost certainly wouldn't have gone in the direction it did except for Tellegen's curiosity about hypnosis (as well, perhaps, as residual 1960s liberalism). The story continues, however, because in current usage "openness" is defined in terms of both absorption and imaginative involvement on the one hand, and what can only be called sociopolitical liberalism on the other (R. R. McCrae & Costa, 1990). The assumption is that these are just two "facets" of a single trait of openness. On the other hand, research indicates that hypnotizability is correlated with the absorption facet of openness, but not with liberalism -- and not with intellectance, either (M. L. Glisky & Kihlstrom, 1993). This work, in turn, stimulated a larger psychometric study that showed that absorption, liberalism, and intellectance are in fact not very highly correlated with each other. At the very least, we need to figure out which of them is the true fifth factor in the "Big Five" structure of personality. But maybe the Big Five are really the Big Seven! At the very least, these hypnosis-inspired results remind us that even the Big Five is not handed down to us from On High, and that the "basic" dimensions of personality ae to some extent products of a particular cultural context. As an aside, this same study indicated that absorption is not very well represented in the trait lexicon. We have lots of words for smart people and for liberals, but not too many for those who have vivid imaginations. So, absorption is largely missing from studies of personality structure that rely on trait adjectives, but appears clearly when appropriate items are incorporated into self-report questionnaires. Here, then, is a theoretical puzzle about personality structure that is posed by hypnosis, and the search for personality correlates of hypnotizability. Turning now to experimental social psychology, it is somewhat surprising that, for all the attention given to social-psychological theories of hypnosis, relatively little experimental work on hypnosis has connected with core topics in social psychology. We know very little, for example, about the relation between attitudes toward hypnosis and actual hypnotic behavior; about what actually transpires between hypnotist and subject, viewed as an interpersonal dyad; how hypnosis and other forms of suggestibility relate to susceptibility to other forms of social influence; how individual subjects influence each other during group hypnosis; what cognates of hypnosis there might be in other cultures. When you scan the table of contents of any survey of social psychology, you realize that hypnosis researchers, even the most social-psychological of them, have barely scratched the surface. Here's an early exception: 40 years before Kevin Ochsner and Matt Lieberman (Lieberman, Ochsner, Gilbert, & Schacter, 2001; Ochsner, Lieberman, Gilbert, & Schacter, 2000) turned to amnesic patients to study basic processes of attitude formation and dissonance reduction, Milton Rosenberg (Rosenberg, 1960) did much the same thing using hypnosis. At issue was the proposition, in Heider's balance theory, that people's attitudes about some issue should be consistent with their beliefs about that issue; and that when there is an incompatibility between the affective and cognitive components of an attitude, the cognitions will be revised to bring them in line with the affect. Rosenberg employed hypnotic suggestion to alter people's affective response to a number of issues, like national health insurance, American relations with the Soviet Union, racial segregation in neighborhoods, and the political union of the United States with Canada. With the help of Phil Zimbardo, Rosenberg suggested changes in subjects' affective response to these attitude objects, and then assessed their beliefs about these same objects. The result was that cognitive change followed affective change, in confirmation of Heider's prediction. 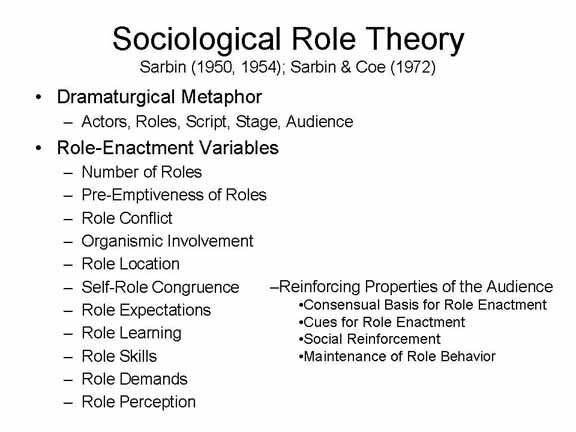 Another important contribution of hypnosis to social psychology was Ted Sarbin's (1950, 1954) role theory, which, while intended as a comprehensive framework for the analysis of social interaction, was inspired by, and best illustrated by, hypnosis (Sarbin & Coe, 1972). Yet another contribution of hypnosis to social psychology was Martin Orne's work on demand characteristics and ecological (Orne, 1962, 1970, 1973) (see also Kihlstrom, 2002). For Orne, experimental subjects were not passive responders to the experimenter's manipulations. Rather, they are sentient, curious creatures, constantly thinking about what is happening to them, evaluating the proceedings, figuring out what they are supposed to do, and planning their responses accordingly. Regardless of the experimenter's intentions and instructions, the subject's behavior in an experiment is determined by his or her perception of the experimental situation -- perceptions that are formed as the subject goes beyond the information given by the experimenter. When the subject's perceptions of the experimental situation are at variance with those of the experimenter, the experiment loses ecological validity. Orne's work on demand characteristics and ecological validity was rooted in hypnosis research, as exemplified by his studies of antisocial behavior (Orne & Evans, 1965). But they have also been applied to social psychology, as in Orne's critique of the Milgram experiment (Orne & Holland, 1968). Raising social psychologists' awareness of these issues was itself a profound, if controversial (Berkowitz & Donnerstein, 1982) contribution to social psychology. But on a more theoretical level, Orne's insistence on viewing the experimental situation from the subject's point of view should be considered a foreshadowing of the "cognitive revolution" in social psychology -- the view that subjects' behavior was not determined by the situation as objectively defined, but rather by their subjective, internal, mental representation of the situation -- their perception and construal of the situation, their memories of previous encounters with similar situations, and their beliefs about the situation at hand. Cognitivism has a long history in social psychology (Thomas & Thomas, 1928), but it really only took hold in the mid to late 1960s, after the cognitive revolution in psychology generally. In that context, Orne was a cognitive social psychologist before its time. Experimental psychology includes experimental psychopathology as well, and one contribution of hypnosis to this field is that, for more than a century, the divisions of consciousness that occur in hypnosis have served as laboratory models for the syndromes of "hysteria", conversion, and dissociation (Kihlstrom, 1979; Kihlstrom & McGlynn, 1991) -- much the same way that fear conditioning has served as a model for phobias, and learned helplessness for depression. Whether you are a dissociation theorist (E. R. Hilgard, 1977) or a sociocognitive theorist (N. P. Spanos, 1996), hypnosis illuminates the processes underlying these rare and puzzling disorders. Another area of experimental psychopathology to which hypnosis can contribute is psychosomatic medicine -- a field area predicated on the view that patients' feelings and beliefs can affect the functioning of their bodies. Psychosomatic medicine is in bad odor in psychiatry and clinical psychology these days -- partly, I think, because of the excesses of psychoanalytic theory (which held, among other things, that bronchial asthma reflected excessive unresolved dependence on one's mother; Alexander, 1950); but also because of the biological revolution in psychiatry and the discovery of, for example, the role of helicobacter pylori in ulcers. By and large, physicians are threatened by the notion that physical symptoms could be produced by ideas, and they want to get rid of psychosomatics by whatever means necessary. DSM-IV, for example, pretty much relegates them to a footnote. Here again, hypnosis reminds us that beliefs and ideas can, in fact, affect bodily functioning. Not just in terms of mental states, like pain, and correlated neural activity; but anatomy and physiology outside the nervous system. Consider, for example, the provocative study by Ikema and Nakagawa (Ikemi & Nakagawa, 1962), who gave subjects with a history of contact dermatitis suggestions that they were being stroked with an allergenic leaf from a lacquer tree (rhus venicifera) or wax tree (rhus succceedanea) similar to our poison oak or ivy, when in fact the leaf was from a harmless chestnut tree, or vice-versa. The results were quite startling: when it was suggested that the harmless plant was poisonous, they showed a positive allergic reaction; when it was suggested that the poisonous plant was harmless, the reaction was substantially reduced. At the risk of making even our pun-prone symposium chairman groan, we may say that it wasn't the leaf that caused the reaction; it was the be-lief. More recent studies of the psychosomatic effects of hypnosis have focused on warts, with Spanos and his colleagues showing that hypnotic suggestion led to significantly more remission than a plausible placebo treatment (N.P. Spanos, Stenstrom, & Johnson, 1988). The fact that a later study showed that nonhypnotic suggestion did as well as hypnotic suggestion (N. P. Spanos, Williams, & Gwynn, 1990) doesn't matter: as with the Raz studies of Stroop interference, nobody would have tried this in the first place if it hadn't been for hypnosis. The important point is that beliefs, arising from suggestion, can have bodily consequences on organs outside the central nervous system. Which completes the circle, by taking us from experimental psychopathology back to consciousness. For many philosophers and other cognitive scientists, the mind- body problem concerns the mysterious leap from the body to the mind. 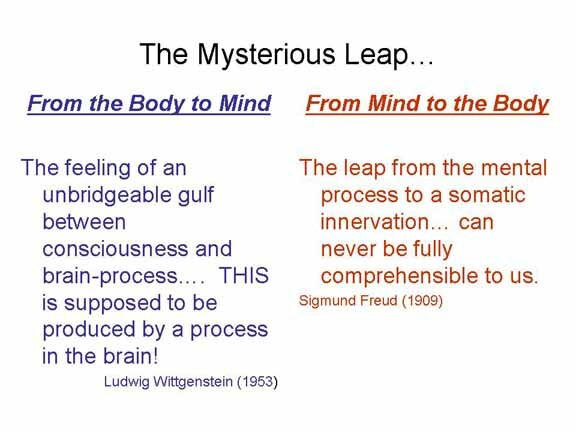 Psychosomatic effects such as these indicate that there is yet another mind-body problem: the equally mysterious leap from the mind to the body. Once again, hypnosis sheds light on psychological processes that might otherwise not be seen, or might not be seen as clearly -- if only we approach hypnosis as a phenomenon that might teach us something new about mind and behavior, instead of approaching it with the received wisdom of established doctrine. Alexander, F. (1950). Psychosomatic medicine: Its principles and applications. New York: Norton. Arnold, M. B. (1946). On the mechanism of suggestion and hypnosis. Journal of Abnormal and Social Psychology, 41, 107-128. As, A., O'Hara, J. W., & Munger, M. P. (1962). The measurement of subjective experiences presumably related to hypnotic susceptibility. Scand. J. Psychol., 3, 47-64. Banister, H., & Zangwill, O. L. (1941a). Experimentally induced olfactory paramnesia. Brit. J. Psychol., 32, 155--175. Banister, H., & Zangwill, O. L. (1941b). Experimentally induced visual paramnesias. British Journal of Psychology, 32, 30-51. Berkowitz, L., & Donnerstein, E. (1982). External validity is more than skin deep: Some answers to criticism of laboratory experiments. American Psychologist, 37, 245-257. Bertrand, L. D., Spanos, N. P., & Radtke, H. L. (1990). Contextual effects on priming during hypnotic amnesia. Journal of Research in Personality, 24, 271-290. Besner, D., Stolz, J. A., & Boutilier, C. (1997). The Stroop effect and the myth of automaticity. Psychonomic Bulletin & Review, 4, 221-225. Blumenthal, A. L. (1990). The intrepid Joseph Jastrow. In G. Kimble, C. White & M. Wertheimer (Eds. ), Portraits of pioneers in psychology (pp. in press). Hillsdale, N.J.: Erlbaum. Bryant, R. A., & McConkey, K. M. (1989). Hypnotic blindness, awareness, and attribution. Journal of Abnormal Psychology, 98, 443-447. Craik, F. I. M., Morris, L. W., Morris, R. G., & Loewen, E. R. (1990). Relations between source amnesia and frontal lobe functioning in older adults. Psychology and Aging, 5, 148-151. Evans, F. J. (1979). Contextual forgetting: Posthypnotic source amnesia. JOurnal of Abnormal Psychology, 88, 556-563. Evans, F. J., & Thorne, W. A. F. (1966). Two types of posthypnotic amnesia: Recall amnesia and source amnesia. International Journal of Clinical and Experimental Hypnosis, 14(2), 162-179. Fiske, D. W. (1949). Consistency of the factorial structures of personality ratings from different sources. Journal of Abnormal & Social Psychology, 44, 329-344. Glisky, E. L., Rubin, S. R., & Davidson, P. S. R. (2001). Source memory in older adults: An encoding or retrieval problem? JOURNAL OF EXPERIMENTAL PSYCHOLOGY-LEARNING MEMORY AND COGNITION, 27(5), 1131-1146. Glisky, M. L., & Kihlstrom, J. F. (1993). Hypnotizability and facets of openness. International Journal of Clinical & Experimental Hypnosis, 41(2), 112-123. Hilgard, E. R. (1964). The motivational relevance of hypnosis. Nebraska Symposium on Motivation, 1-40. Hilgard, E. R. (1977). Divided consciousness: Multiple controls in human thought and action. New York: Wiley-Interscience. Hilgard, J. R. (1965). Personality and hypnotizability: Inferences from case studies. In E. R. Hilgard (Ed. ), Hypnotic susceptibility. New York: Harcourt, Brace, & World. Hilgard, J. R. (1970). Personality and hypnosis: A study in imaginative involvement. Chicago: University of Chicago Press. Hull, C. L. (1929). Quantitative methods of investigating waking suggestion. Journal of Abnormal & Social Psychology, 24, 153-169. Hull, C. L. (1930a). Quantitative methods of investigating hypnotic suggestion. Part 1. Journal of Abnormal & Social Psychology, 25, 200-223. Hull, C. L. (1930b). Quantitative methods of investigating hypnotic suggestion. Part 2. Journal of Abnormal & Social Psychology, 25, 390-417. Hull, C. L. (1933). Hypnosis and suggestibility: An experimental approach. New York: Appleton. Hull, C. L. (1943). Principles of behavior. New York: Appleton-Century. Hull, C. L. (1952). A behavior system. New Haven: Yale University Press. Ikemi, Y., & Nakagawa, S. (1962). A psychosomatic study of contagious dermatitis. Kyushu Journal of Medical Science, 13, 335-352ff. Kihlstrom, J. F. (1979). Hypnosis and psychopathology: Retrospect and prospect. Journal of Abnormal Psychology, 88(5), 459-473. Kihlstrom, J. F. (1980). Posthypnotic amnesia for recently learned material: Interactions with "episodic" and "semantic" memory. Cognitive Psychology, 12, 227-251. Kihlstrom, J. F. (2004). Clark L. Hull, hypnotist [Review of Hypnosis and Suggestibility: An Experimental Approach by C.L. Hull]. Contemporary Psychology, 49, 141-144. Kihlstrom, J. F. (2006). The automaticity juggernaut. In J. Baer, J. C. Kaufman & R. F. Baumeister (Eds. ), Psychology and free will (pp. in press). New York: Oxford University Press. Kihlstrom, J. F. (2007). Consciousness in hypnosis. In P. D. Zelazo, M. Moscovitch & E. Thompson (Eds. ), Cambridge Handbook of Consciousness (pp. 445-479). Cambridge: Cambridge University Press. Kihlstrom, J. F., Barnhardt, T. M., & Tataryn, D. J. (1992). Implicit perception. In R. F. Bornstein & T. S. Pittman (Eds. ), Perception without awareness: Cognitive, clinical, and social perspectives. (pp. 17-54). New York, NY, USA: The Guilford Press. Kihlstrom, J. F., & McConkey, K. M. (1990). William James and hypnosis: A centennial reflection. Psychological Science, 1(3), 174-178. Kihlstrom, J. F., & McGlynn, S. M. (1991). Experimental research in clinical psychology. In M. Hersen, A. E. Kazdin & A. S. Bellack (Eds. ), Clinical psychology handbook (2nd ed.). (2nd ed., pp. 239-257). New York: Pergamon Press, Inc.
Kirsch, I., & Lynn, S. J. (1997). Hypnotic involuntariness and the automaticity of everyday life. American Journal of Clinical Hypnosis, 40(1), 329-348. Lieberman, M. D., Ochsner, K. N., Gilbert, D. T., & Schacter, D. L. (2001). Do amnesics exhibit cognitive dissonance reduction? The role of explicit memory and attention in attitude change. PSYCHOLOGICAL SCIENCE, 12(2), 135-140. MacLeod, C. M. (1992). The Stroop task: The "gold standard" of attentional measures. Journal of Experimental Psychology: General, 121(1), 12-14. Mallard, D., & Bryant, R. A. (2001). 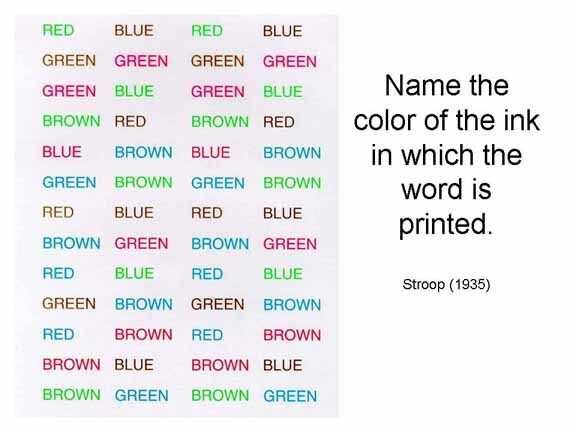 Hypnotic color blindness and performance on the Stroop test. International Journal of Clinical and Experimental Hypnosis, 49, 330-338. McCrae, R. R., & Costa, P. T. (1980). Openness to experience and ego level in Loevinger's Sentence Completion Test: Dispositional contributions to developmental models of personality. Journal of Personality & Social Psychology, 39(1-sup-6), 1179-1190. McCrae, R. R., & Costa, P. T. (1990). Conceptions and correlates of openness to experience. In S. R. Briggs, W. H. Jones & R. Hogan (Eds. ), Handbook of Personality Psychology (pp. in press). New York: Academic. Norman, W. T., & Goldberg, L. R. (1966). Raters, ratees, and randomness in personality structure. Journal of Personality and Social Psychology, 4, 681-691. Ochsner, K. N., Lieberman, M. D., Gilbert, D. T., & Schacter, D. L. (2000). Attitude change in amnesia: A social cognitive neuroscience approach. JOURNAL OF COGNITIVE NEUROSCIENCE(Suppl), 57. Orne, M. T. (1970). Hypnosis, Motivation, and the ecological validity of the psychological experiment. In W. J. Arnold & M. M. Page (Eds. ), Nebraska Symposium on Motivation (pp. 187-265). Lincoln, Ne:: Univ. of Nebraska Press. Orne, M. T. (1973). Communication by the total experimental situation: Why it is important, how it is evaluated, and its significance for the ecological validity of findings. In P. Pliner, L. Krames & T. Alloway (Eds. ), Communication and affect (pp. 157-191). New York: Academic. Orne, M. T., & Evans, F. J. (1965). Social control in the psychological experiment: Antisocial behavior and hypnosis. Journal of Personality and Social Psychology, 1, 189-200. Orne, M. T., & Holland, C. H. (1968). On the ecological validity of laboratory deceptions. International Journal of Psychiatry, 6, 282-293. Raz, A., Kirsch, I., Pollard, J., & Nitkin-Kaner, Y. (2006). Suggestion Reduces the Stroop Effect. Psychological Science, 17(2), 91-95(95). Raz, A., Shapiro, T., Fan, J., & Posner, M. I. (2002). Hypnotic suggestion and the modulation of Stroop interference. Archives of General Psychiatry, 59, 1155-1161. Rosenberg, M. J. (1960). Cognitive reorganization in response to the hypnotic reversal of attitudinal affect. Journal of Personality, 39-63. Sarbin, T.R. (1950). Contributions to role-taking theory: I. Hypnotic behavior. Psychological Review, 57,, 255-270. Sarbin, T.R. (1954). Role theory. In G. Lindzey (Ed. ), Handbook of social psychology (Vol. 1, pp. 223-258). Cambridge, Ma. : Addison-Wesley. Sarbin, T.R., & Coe, W.C. (1972). Hypnosis: A social psychological analysis of influence communication. New York: Holt, Rinehart, & Winston. Schacter, D. L., Harbluk, J. L., & McClachlan, D. R. (1984). Retrieval without recollection: An experimental analysis of source amnesia. Journal of Verbal Learning and Verbal Behavior, 23, 593-611. Shimamura, A. P., & Squire, L. R. (1987). A neuropsychological study of fact memory and source amnesia. Journal of Experimental Psychology: Learning, Memory, and Cognition, 13, 464-473. Shor, R. E. (1960). The frequency of naturally occurring "hypnotic-like" experiences in the normal college population. International Journal of Clinical & Experimental Hypnosis, 8, 151-163. Spanos, N. P. (1996). Multiple identities and false memories: A sociocognitive perspective. Washington, D.C.: American Psychological Association. Spanos, N. P., Gwynn, M. I., Della Malva, C. L., & Bertrand, L. D. (1988). Social psychological factors in the genesis of posthypnotic source amnesia. Journal of Abnormal Psychology, 97, 322-329. Spanos, N. P., Radtke, H. L., & Dubreuil, D. L. (1982). Episodic and semantic memory in posthypnotic amnesia: A reevaluation. Journal of Personality and Social Psychology, 43, 565-573. Spanos, N. P., Stenstrom, R. J., & Johnson, J. C. (1988). Hypnosis, placebo, and suggestion in the treatmet of warts. Psychosomatic Medicine, 50, 245-260. Spanos, N. P., Williams, V., & Gwynn, M. I. (1990). Effects of hypnotic, placebo, and salicylic acid treatments on wart regression. Psychosomatic Medicine, 52, 109-114. Tulving, E. (1983). Elements of episodic memory. Oxford, U.K.: Oxford University Press. Wagstaff, G. F. (1981). Source amnesia and trance logic: Artifacts in the essence of hypnosis? Bulletin of the British Society of Experimental and Clinical Hypnosis, 4, 3-5. Young, P. C. (1937). The veridicality of hypnotically induced regression. Psychological Bulletin, 34, 784. Young, P. C. (1940). Hypnotic regression--fact or artifact? Journal of Abnormal & Social Psychology, 35, 273-278. Young, P. C. (1950). The possibility of antisocial uses of hypnosis. American Psychologist, 5, 327-328. Young, P. C. (1952). Antisocial uses of hypnosis. In L. M. LeCron (Ed. ), Experimental hypnosis (pp. 376-409). New York: Macmillan. This page last modified 07/07/2011 04:02:24 PM .